What comes to mind when we think of bats? For most people, bats conjure images of witches, ghosts, goblins and other scary Halloween creatures. While bats are integral to the Halloween tradition, they are fascinating beings in their own right and deserve our attention and admiration. As it happens, right now is National Bat Week (October 26th to November 1st). Bats are the only mammals capable of true, sustained flight (flying squirrels and gliding possums can only glide for short distances). Bats are members of the mammalian order Chiroptera, which is derived from Greek and means “hand-wing.” The bat’s wing is comprised of elongated finger bones covered with a thin membrane of skin called patagium. 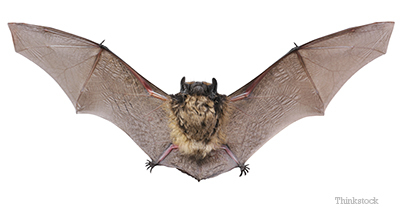 Bats fly by flapping their hands (with their digits spread-out), unlike birds that flap their entire forelimbs. Another unique feature of bat wings is that the tips of their finger bones (i.e. “wings”) lack calcium and other minerals normally found in bones. This allows their finger bones to be very flexible and bend without breaking. Did you know, according to the Defenders of Wildlife website, that there are almost 1000 different species of bats and that bats represent about a quarter of all classified mammals worldwide? Bats are versatile animals and are found in all climates except the arctic regions and extreme deserts. The majority of bats are insectivores, followed by fruit eaters. There are a few species that feed on other animals (besides insects). Of course, there is also the infamous vampire bat. Like their silver screen counterparts, vampire bats feed exclusively on blood. Despite their worldwide fame, there are only three species of vampire bats and they only live in Latin America (not Transylvania). Bats are an important part of our ecosystem. Fruit bats, which are found in tropical and subtropical climates, help pollinate flowers and disperse fruits seeds. There are many tropical plants that would not be able to propagate without the help of bats. Insect eating bats are equally important. They help control the insect population and therefore reduce our need for pesticides. Click here to learn about the role African fruit bats play in the spread of Ebola. Unfortunately you cannot tell by just looking at a bat whether or not it is infected with rabies. Bats are fascinating animals that are vital to our ecosystem. If you ever encounter a bat in the wild, remember not to touch or handle it, and call your local wildlife center or animal shelter for assistance.